I love cookies. There have been very few cookies that I have ever eaten that I haven't had more than one. Cookies just cry out to be eaten by me. However, as I have gotten older I have began to understand that my metabolism isn't what it used to be. I also have made efforts to eat as healthy as I can to prevent the health problems that my mother and grandmother had. In order to still be able to eat cookies, while thinking of my health I have learned ways to modify recipes. One great way to reduce the bad fats is to replace butter with olive or canola oil. I also replace granulated sugar with honey, molasses, sorghum or agave. It is a great way to increase the healthy qualities in baked goods. Today I tried a new recipe for Vegan Oatmeal Dried Cherry Cookies that I received in a pamphlet in the mail. This recipe has 10 ingredients. It takes 15 minutes of total time, 5 minutes of which is active and makes 25 cookies. I made significant changes to this recipe. First instead of using granulated sugar I used sorghum. Additionally since I eat gluten free I replaced the whole wheat flour with brown rice flour. I didn't have chocolate chips in my pantry so I used dried cherries instead. Finally, I found my baking time to be much longer than the ten minutes suggested by the recipe. I would suggest adding an additional 5 minutes to fully brown. I followed the remainder of the recipe as written. I wasn't sure what my kids would think of gluten free vegan cookies. They loved them though and ate almost the entire batch by themselves. My husband was an even bigger surprise since he loved the cookies almost as much as my kids. These cookies were definitely popular in my house and I love that they are made without granulated sugar and use canola oil instead of butter. This is a recipe that I will make again and try new options, dried cranberries, white chocolate chips etc. 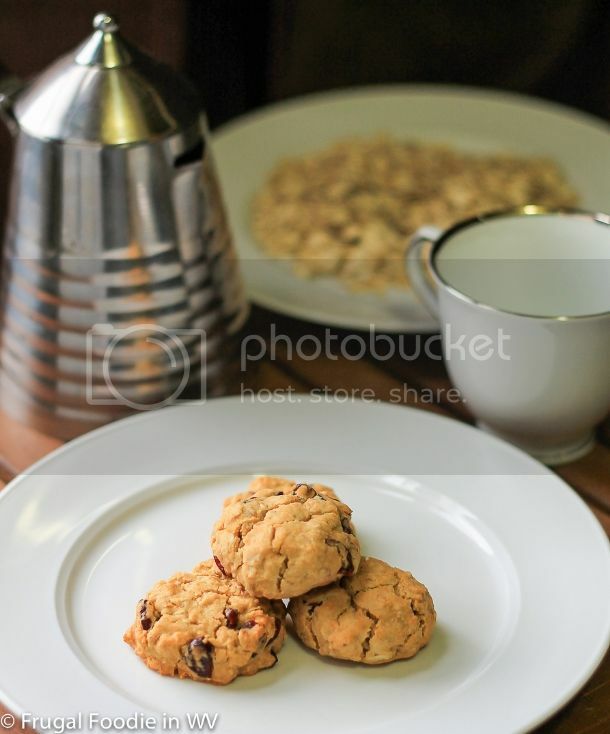 For the recipe go to Chewy Oatmeal Cookies. They look awesome! I love anything with cherries. Thanks :) I love cherries also, they are yummy! Followed you back, come back again soon! Looks terrific and I like that this is a healthier cookie choice! Now that I am beginning a diet things like this are what I will need. I am trying to cook healthier also. I always have cooked from scratch, but I'm trying to cut down on butter and sugar in our diets. My SIL is a vegan and I remember back before I knew any better, I thought vegan food had no taste, but I was very wrong. I bet these are as tasty as they look - and much healthier. Vegan is not nearly as tasteless as it once was, and those look amazing. I like that they're chunky! Thanks :) I agree that vegan cooking and baking has come a long way! It's nice to have a healthy alternative to a snack (especially a cookie!) that the fam. still loves. Job well done (and they look yummy). Yum! Dried cherries sound really good in chewy cookies. I just had a homemade chocolate/cherry scone on saturday and it was crazy good! I love chocolate and cherries together, your scones sound wonderful!! These look delicious! Your photo is beautiful :) I love the fact that it is a wholesome recipe but still seems like it tastes good! Thanks for the sweet comments :) I love recipes that taste good and have nutrition also it's a great combination! Cherries are probably my favorite fruit! I don't know why I've never used them in cookies before. Thanks for the recipe. Can't wit to try these! Thanks, they worked out really well! I am a kindred spirit on the cookie thing. I love that you are expiramenting on making them healthier. I have been wanting to do the same and you have some great tips to get me started! Thanks! It's been a lot of trail and error :) Glad to be of help!